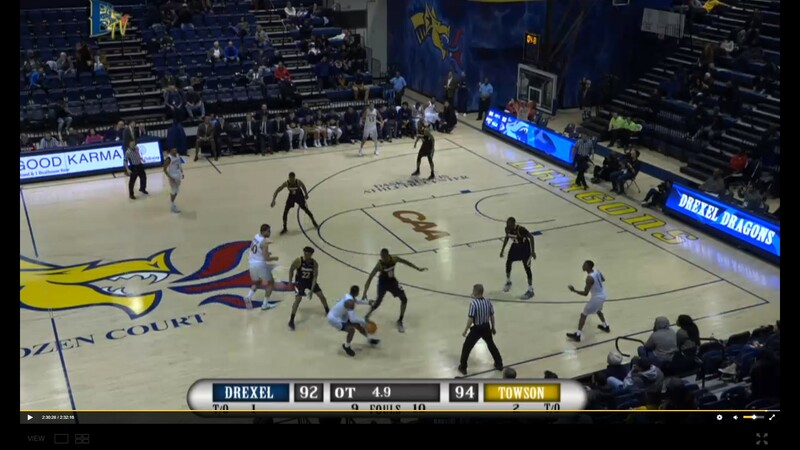 Drexel took to the court on Thursday night as one of the hottest teams in the CAA. They were pitted against a Towson Tigers team that undoubtedly was licking their wounds after a tough loss to basement dweller JMU. The contest followed the Philadelphia Eagles’ Super Bowl parade, and Drexel put a lot out there to try to get fans into the stands. It started with free tickets for season ticket holders, and then moved on to free tickets to anyone arriving in Eagles gear. Despite their attempts, the crowd ended up being what can best be described as balanced, occasionally feeling like a game being held down in Baltimore. But that is a story for another post. . .
Once again, the Drexel Dragons entered the backside of a pair of matchups having lost to their opponents the first time around. Games earlier in the month against JMU and William & Mary ended in a victory for Zach Spiker’s Dragons, and Thursday they would try to do the same. For the first twenty-five minutes, they made the Drexel faithful who had come out for the contest believe that might be possible. The first half saw Drexel do the things that they needed to beat Towson. They outrebounded the Tigers in Drexel’s defensive half of the court eight to three. They kept their turnovers low and capitalized on the eight giveaways Towson had. They pressured the ball effectively enough that Mike Morsell and Eddie Keith II each picked up a pair of fouls. Tramaine Isabell scored a game high 15 points in the first twenty minutes, adding four assists and four rebounds. The second half started with much of the same, and even some considerably more dominant play by the Dragons. Aided by 2 of 11 shooting to open the half for Towson, Drexel ballooned their lead to 18 points when they led 67-49 with 11:11 remaining. Everything was going right for the Dragons until in one substitution just 17 seconds later, when everything seemed to start falling apart. With 10:52 remaining in the game and Drexel up 15 points, Austin Williams limped to the Drexel bench with an apparent injury to his right foot. He would be replaced by Tyshawn Myles, and his team would feel the effects of the absence of their best defensive player. For the remaining 10:52 of regulation, Drexel would be outrebounded 13 to 6. When asked to secure Towson’s missed shots, the numbers got even worse. 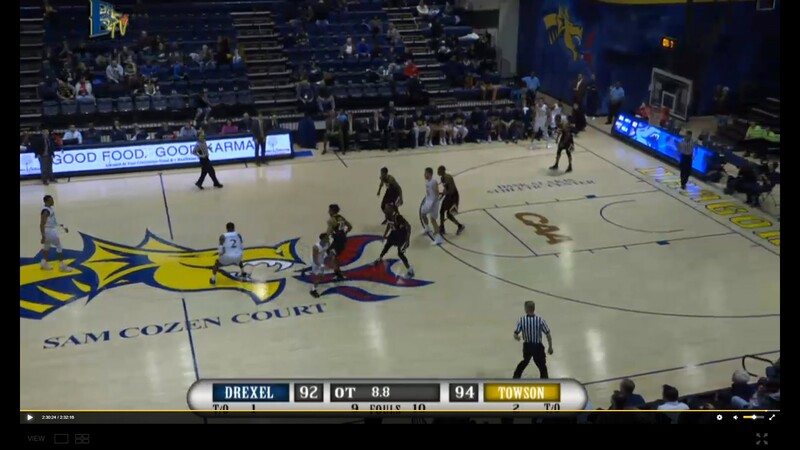 In Drexel’s defensive half, they were outboarded 7 to 1 in the 10-minute span. Effective offensive rebounding and some torrid shooting helped push Towson to a 32-16 run after Williams left the game. It really showed the importance of Williams both on the offensive and defensive ends of the floor. While he did not pour in the buckets, his mere presence caused a vacuum on the offensive end creating space for his teammates, and a real threat on the drive on the defensive end. As the game wound down, Drexel found themselves in need of a few clutch plays they would need to convert on to put Towson away. 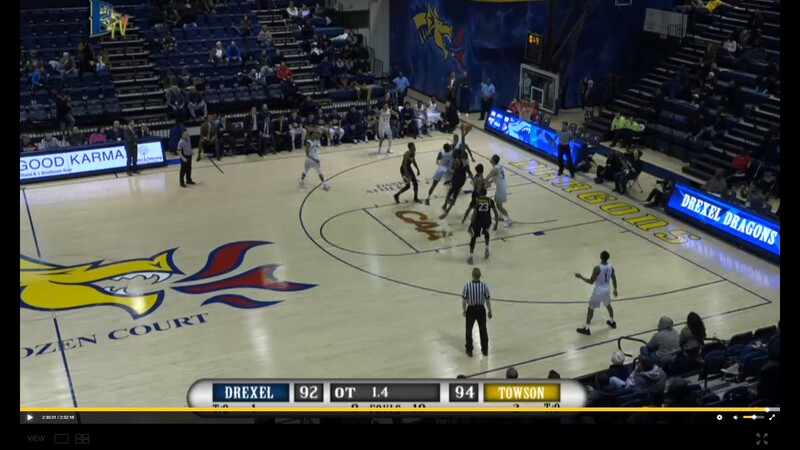 In the closing seconds of regulation, Drexel found themselves with the ball and the shot clock off. Their setup was familiar. Tyshawn Myles and Tramaine Isabell stood at the top of the key, offering Kurk Lee the opportunity to have an on the ball pick of his choosing. As the seconds ticked away, the crowd and most likely the players on the court waited for Lee to make his choice, and he did not settle on either pick, instead choosing to shoot a three that careened off the rim, sending the game into overtime. While the Dragons were struggling with finding a way to the basket, the three ball had not been their friend. Prior to that shot by Lee, they were 6 of 14 from the outside. While Lee had been contributing offensively, the shot selection was an interesting one, especially considering that they did not need the three ball outright to win or tie, and Towson had already collected a number of fouls that half. As Coach Spiker said after the game, had Lee made that shot, he would have been the big hero of the night. It was a gamble, and it did not convert. A drive seemed like the logical choice and Drexel could not sneak a quick shot past the Tigers. After a back and forth overtime, Drexel found themselves with the last possession once again, this time trailing by two points. As the team crossed half court, Isabell picked the ball up high started to move to his right. He wanted the lane. He wanted to go left. With Troy Harper late coming down the floor, the pick was not there, and Harper’s man was able to slack to the top of the key preventing Isabell from making a move on his own. Isabell and Alihan Demir were left to play 2-on-3. Drexel’s leading scorer probed and probed. The pair tried a pick and roll but it did not free up the big man enough for a clean look to the lane. With Harper’s man still playing help side defense, Isabell was still effectively facing a double team and a dish to Lee would have put him in the same situation. As Harper drifted down to the extended elbow on the left side, his man took a step out to cover him more effectively. Isabell finally found a hole and followed Demir into the lane, the Towson defenders all collapsing on Drexel’s leading scorer. Isabell could not get the shot to fall, and Demir, who came down with the offensive board, could not get a shot off himself. The buzzer sounded, and the Towson Tigers would walk off the floor victorious by a score of 94-92. Basketball is a team sport. Five guys, on the court together, playing for a unified goal. Just because a player is not the guy standing at the top of the key holding the ball, that does not mean that they do not have a role to play in converting that possession. At that moment in the game, the guy who has two points is just as important as the guy who has thirty-two. Zach Spiker makes it no secret who is going to be holding the ball when the game is on the line. It is up to the other guys on the court to help create the best shot possible. During their recent four game winning streak, Drexel was successful because they played team ball. If they want to get this train back on the rails, they are going to have to get back to a team first mentality for the full 40 minutes. Despite the tough finish, Tramaine Isabell once again did everything that he could on the offensive end of the court to put his team up and keep them in the game. The junior transfer earned Thursday’s player of the game honor with 32 points, six rebounds and seven assists. Honorable mention, however, goes to Tyshawn Myles. The senior big man who has struggled with injuries this season left it all on the court Thursday. On paper, his numbers might not jump off the page but the ones that are not reported are important ones. He broke up a in the first half that generated a steal for the Dragons and a bucket at the other end, and drew a charge in the closing moments of the first 20 minutes. His foot speed looked better at both ends of the court. Myles gave his all for his team when he was asked to, and we applaud him for that. After leaving the game, Austin Williams returned to the bench in the closing minutes of the second half, a boot on his right foot and crutches helping to support his weight. As expected, there was little reported about his condition following the game. With five games remaining, the big man’s injury could spell real trouble for a Drexel team that had been looking as if they had finally been getting things together. To add to the sting of last night’s loss, elsewhere in the CAA, Hofstra beat Elon and Northeastern bested Delaware. Had Drexel been able to pull this one out, they would have pulled into a three-way tie for fifth in the conference with Elon and Towson, and they would have had more of a cushion ahead of UNCW and Delaware. The Drexel Dragons now head on the road for what is without a doubt their toughest stretch of games this season as they take on the top three teams in the conference, Charleston, Northeastern and Hofstra, on the road. Saturday’s game is a 4pm start and as always, it will be broadcasted on the CAA Network.